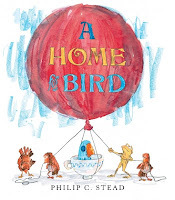 So I had just been thinking that I haven't posted too many picture book titles lately and was planning my next post to be just that. Then I log in this morning and remember that it's 10 for 10 day in the blogosphere. This is my shopping list when I go to Cover to Cover next week. Otto the Book Bear by Katie Cleminson: This is actually from 2011 but I hadn't heard of it until I found it on the "new" shelf at my local library. 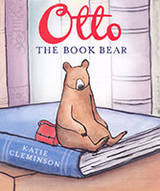 Otto is a bear that lives in a child's book. He likes nothing better than his book being enjoyed by his owner. At night Otto comes alive and explores the house. 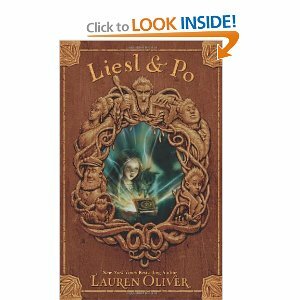 When his book is packed in a box and forgotten, Otto takes a journey that ends in a very magical place. I'm thinking this may be fun book to start the year with in THE PIT. Good News, Bad News by Jeff Mack: A mouse and a rabbit go back and forth with the simple phrases of "Good News!" and then "Bad News." The story continues back and forth to the end with the rabbit always positive and the mouse just the opposite. This choice will make a very fun classroom selection to practice predicting or creating alternative endings. 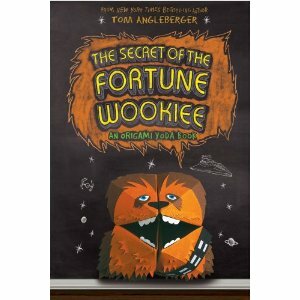 I think kids could take this story on and on and on laughing all the way. Surfer Chick by Kristy Dempsey; Ill by Henry Cole: One way I choose a read aloud for THE PIT is when I hear voices of the characters in my head as I read it. I heard them immediately when I read this one. A small chick who was born at the beach yearns to surf like her dad. She tries with little success at first but with her dad's help and persistence, she eventually becomes the star of the beach surfing like a champion. Henry Cole's illustrations just add the fun, seriously, who draws chickens better than Henry Cole! 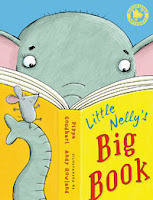 Little Nelly's Big Book by Pippa Goodhart; Ill by Andy Rowland: Little Nelly is a smallish elephant who identifies herself as a mouse using a big book of knowledge. She begins her life as a mouse, living behind the walls and eating things a mouse would eat. Eventually, the very welcoming mice decide it's time to take Little Nelly to the zoo and show her some "zoo mice" and Little Nelly figures out who and what she really is. However, one of the mice develops a bit of an identity crisis for a fun ending. One of a Kind by Ariel S. Winter; Ill by David Hitch: At a school full of twins, Leo stands out because he is an only. The problem is, Leo feels left out because everyone else has an automatic friend and he is sort of forgotten in a world of multiples. Each year the school celebrates Individuality Day where the twins compete to show off how different they are from one another and Leo becomes a hero. 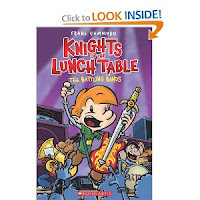 King Arthur's Very Great Grandson by Kenneth Kraegel: Henry Alfred Grunnmorson, the several times over great grandson of King Arthur wants to go on a quest to slay a great beast on his 6th birthday. He meets several mythical great beasts and all turn out to be meek and just looking for a friend to do things with. When Henry expresses his disappointment they send him on to the next beast until he meets one who REALLY scares him and then he decides he'll just be friends. Chick and Chickie Play All Day by Claude Ponti: The Toon Books are big hit in the library, they just don't stay on the shelves. If you're unfamiliar with them they're sort of beginner graphic novels and kids love them. In this one two little chicks create masks and then use them to torment the letter a. 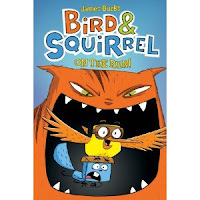 Very fun and I know kids are going to laugh out loud at the antics in this book. 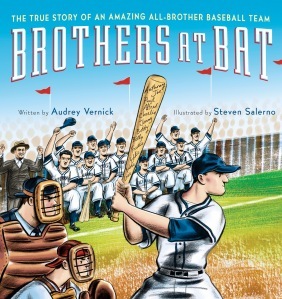 The True Story of an Amazing All-Brother Baseball Team: Brothers at Bat by Audrey Vernick; Ill by Steven Salerno: The 9 Acerra Brothers played baseball in the early part of the 1900s and were very good at it. After several of them served in WWII, they came home and picked up where they left off, touring the east playing baseball and winning. Their family's achievements and playing accomplishments are celebrated in the Baseball Hall of Fame in Cooperstown. 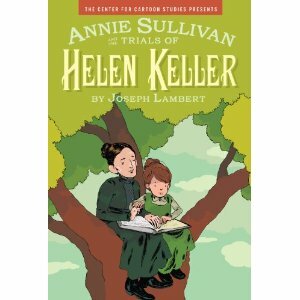 An inspirational non-fiction story with pictures done in a style that reflects the time period. Very well done. 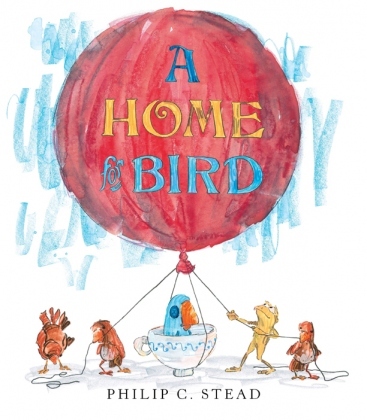 A Home for Bird by Philip C. Stead: Vernon the frog finds a wooden bird and knows he must return him to his home. He hops everywhere and tries many different possible homes. None of them seem right and the bird seems unhappy because he won't speak. Vernon keeps on trying, eventually finding the bird's home where Vernon finally hears his voice. As with all of Stead's books, this is another winner that will be popular with the kids. The ending is simply wonderful. 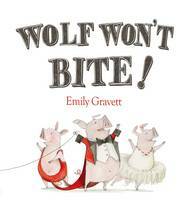 Wolf Won't Bite by Emily Gravett: I always look forward to Emily Gravett's books. Here stories never disappoint and usually come with some sort of surprise ending. A twist on the Three Pigs, they actually capture a live wolf in this story and turn him into a circus performer. The repetitive title line will make it extra fun in THE PIT and I know none of my students will see the end coming. I can't wait to share it with the Bailey Kids! So there are my 10 for 10. As always this even is hosted by Cathy and Mandy at Reflect and Refine thanks again ladies! I will be honest; up until a week ago, I hadn't thought much about this challenge since life had gotten so busy. But then, I made a trip to Cover to Cover last Friday, and all of that changed. 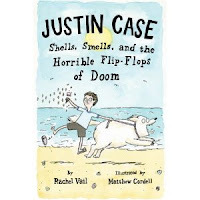 When I was there, I found several amazing new nonfiction books that I'm thrilled to add to my classroom library. I will be starting the year with a nonfiction study, and will be weaving nonfiction in throughout the year. Finding these books just added to my already strong nonfiction mentor text collection. I knew I had my pile of 10 For 10! 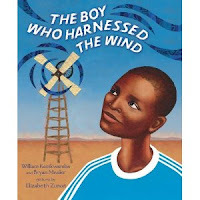 The Boy Who Harnessed the Wind by William Kamkwamba and Bryan Mealer -- I was a huge fan of Energy Island, which is another book that dealt with an entire island embracing the idea of harnessing the wind for energy use. So when I saw this book, I had to have it. What makes this story even more powerful is that a child is the hero here. And the pictures by Elizabeth Zunon are stunning. Great find! Golden Domes and Silver Lanterns: A Muslim Book of Colors by Hena Khan -- This book belongs in my nonfiction library because it's so beautiful, and shares with me a culture I knew very little about. However, I need to know; several of my students the past few years are Muslim, and I've never really had a book in our library that honored their culture. It will be a great conversational starter as we look at many cultures throughout our school this year. Bug Off! 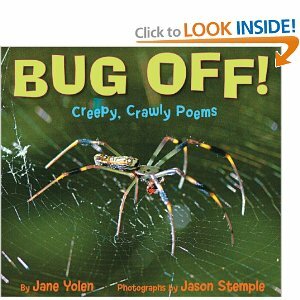 Creepy, Crawly Poems by Jane Yolen -- I love the format of this book; it reminds me of The Dark Emperor. 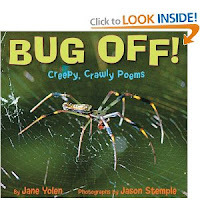 There is a poem on each page about a specific bug, but it is followed by a "typical" nonfiction paragraph that gives us even more information. For kids who love bugs this is a great find. 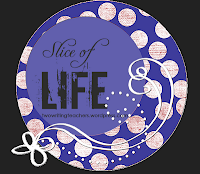 For a writing mentor, it is even a better find! And the photographs by Jason Stemple are amazing. Penguins: Meet the Heroes of a Frozen World -- this book comes from the Scholastic "Discover More" series; I will most definitely be looking for more of these books. In a time where our students need to negotiate and make sense of nonfiction, this book will be a great addition to our classroom library. 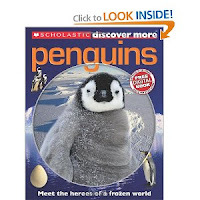 Each page has different nonfiction characteristics, so the learning about how to find information and read more deeply about the topic of penguins would be great mini-lesson material. Again, the photographs used will make the reader happy. 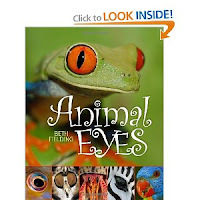 Animal Eyes by Beth Fielding -- Once again, the photographs really are the highlight of the book. 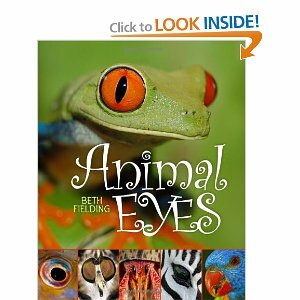 The author was able to get amazing close-ups of a variety of animals - I was totally enthralled as I looked at all the eyes. The nonfiction text that accompanies the photographs is just icing on the cake - great descriptions of how the animals' eyes are used. 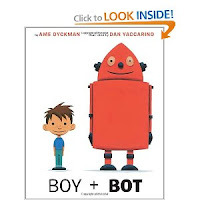 This would be a great mentor text for anyone writing research and having a difficult time getting a narrow enough focus - an entire book just about eyes! Timeless Thomas: How Thomas Edison Changed Our Lives by Gene Barretta -- What a wonderful book! I knew Thomas Edison was much more than just the inventor of lightbulbs, but I'm not sure I realized just HOW much more. 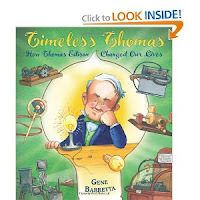 This book has a user-friendly layout -- for every 2-page layout, on the left side it shows something we use in present day, and on the right hand side, the author details in accessible language how they looked in Edison's Lab. The book doesn't focus at all on the man, but more his contributions to our everyday life. Outside Your Window: A First Book of Nature by Nicola Davies -- This book was actually recommended to me by Katie from Creative Literacy. 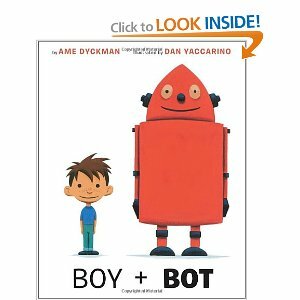 This is a thicker book than your average picture book, but still easy to access. 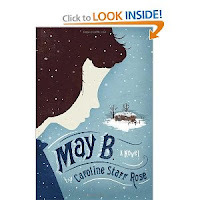 The author has divided the books into seasons, and has written gorgeous poems that reflect that time of year. But the poems are far more than just beautiful words; they also inform. The illustrations by Mark Hearld are a perfect accompaniment. Annie Sullivan and the Trials of Helen Keller by Joseph Lambert -- I think biographies can sometimes be cumbersome for students, so I've always enjoyed picture book biographies and have many in my classroom library. But the next two graphic novels take it a step further; by looking at and thinking about the story one frame at a time, students will glean much more information from this sort of biography. Both this book and the next one were published by The Center for Cartoon Studies. Not only does this graphic novel do a great job making this story accessible to children, but for those who want even more details, they have included panel discussions in the back of the book that shed even more light on certain situations. Amelia Earhart: This Broad Ocean by Sarah Stewart Taylor and Ben Towle -- I loved last year's Amelia Lost, and thought it was an amazing example of nonfiction, but I never really thought my 5th graders would love it as much as me, and that seemed to be the case. 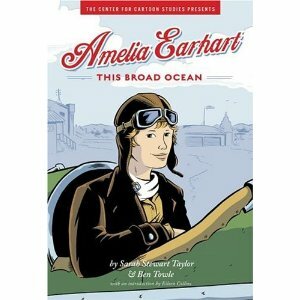 However, I predict that this graphic novel of Amelia's life will get far more attention. Artistically, the illustrators stuck to a pretty monochromatic pallette of blue, black, and white, so there's not a lot of color popping off each page. But it still draws the eye in, and allows the reader to really focus on the combination of words and pictures. I really plan on getting even more of the biographies from the Center for Cartoon Studies! 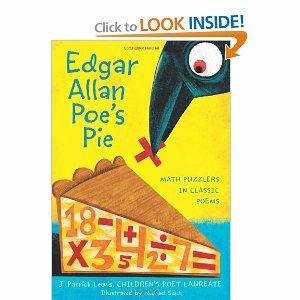 Edgar Allen Poe's Pie: Math Puzzlers in Classic Poems by J. Patrick Lewis -- I am a huge fan of the very prolific J. Patrick Lewis so when I saw this book at Cover to Cover, I needed to have it. I think Lewis is amazing when it comes to sharing information through poetry. He doesn't disappoint here -- I don't usually buy math books, but this is one students will want to curl up with as they try to figure out the different number puzzles. So there you have it, my 2012 10 For 10. Thanks so much to Cathy and Mandy for hosting this event; I look forward to reading all the unique ways other folks have grouped their picture books. 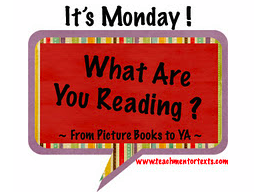 Happy picture book reading to all!! A few weeks ago, I was fortunate enough to take part in a three day writing retreat. On the last day of the retreat, we all did some final reflections. One of those reflections was wrapped around a word we were given at the beginning of our time together. The word I reflected on was "gratitude". Using that word again, I'd like to reflect on that important word again, only given a different context. 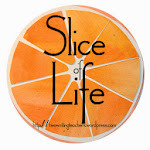 having lunch with a friend who held my hand when I first got the news and heard the words "basal cell skin cancer"
This post is dedicated to Ed, my cousin is going through an awful issue with both rectal and liver cancer. He exudes a positive attitude everyday and continues to be grateful for so much. He is the inspiration for my post on gratitude. My issue was microscopic compared to his, but he leads by example. "It means you're not alone. No matter what." Powerful stuff! And I would love to talk to someone who has read the book, so please let me know!! 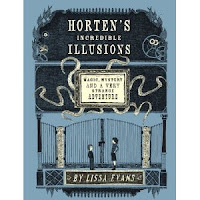 Horten's Incredible Illusions - I just read Horten's Miraculous Mechanisms this summer and really enjoyed it. This sequel did a good job tying up some loose ends for me. Once again magic is the centerpiece of the story, but the importance of knowing what you value and who your friends are is important as well. I'm glad it's coming out in September so that students who enjoyed the first book will be able to grab the second one right away. Ungifted - Read this ARC recently, and the actual publish date can't come too soon!! 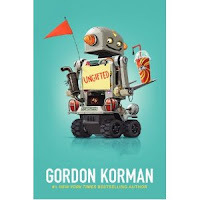 (Sept. 2012) Gordon Korman is at his best in this book, as we follow the adventures of a huge trouble maker who is just an average guy, but accidentally ends up in a gifted school with kids he initially views as geeks. He is "hiding out" there as he tries to avoid the superintendent of schools after causing massive damage during one of his many pranks. Kids will love the different narrators of the story, and will love how an average guy can make all the difference in the world to a group of incredibly talented students. Must read! Oh No! Not Again! - written by Mac Barnett and illustrated by Dan Santat - funny stuff! 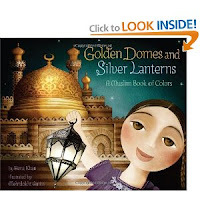 Golden Domes and Silver Lanterns: A Muslim Book of Colors - For the past few years, I've had many Muslim children in my classroom, but no books that represented them within our library, I'm embarrassed to say. 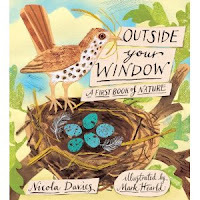 This is a lovely book that will serve as a great conversational starter about many different cultures. Creepy Carrots - This book is due out in about a month - hysterical!! Kids will love it! A fun picture book that allows for some inferring while having a blast enjoying the pictures. Rocket Writes a Story - If I taught primary grades, I would most definitely have this in my writing mentor tubs for kids who are stuck with what to write. Really enjoyed this. Rocket is stuck with his story, but when given some wonderful words, is able to craft something meaningful to him. I like to have a list of "go to" authors in the library. Authors I know that write great stories, usually short, and always easy to relate to. Authors like Barbara O'Connor, James Preller, Gordon Korman and Andrew Clements just to name a few. I know I can always count on authors like these when I recommend their books to kids who are having trouble finding something to read. One of those "go to" authors has a new book out and just like the others, I know kids are going to like it. 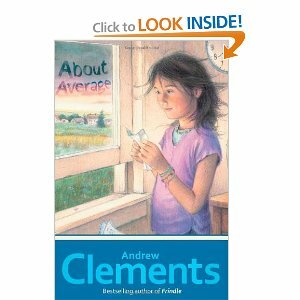 Andrew Clements new book, About Average is about Jordan Johnston a sixth grade girl who was hoping this would be her year to stand out at something. However, it's in the last week of school, and she still isn't the most athletic, the most talented musician, or even the tallest or shortest. She's just Jordan, plain and average like the character in one of her favorite books, Sarah Plain and Tall. To make matters worse she is the victim of a bully. Andrew Clements has a way of writing about kids that is completely accurate and true. In About Average he does it again. Jordan struggles with how to handle Marlea the bully. She has learned all of the right things to do, tell an adult, talk to the guidance counselor, walk away, everything we teach kids to do with a bully, but, like most kids, she doesn't believe any of them will work and feels they will probably make things worse for her. The relationships between Jordan and her friends and teachers are so realistically written that I know a lot of kids will see them in this story. The end has some pretty dramatic changes that hopefully most kids won't have to go through, but the message that you need to be ready in case of anything is loud and clear. I'll be recommending this book to all of my students grades 3 through 5 as I do all Andrew Clements books. A couple of weeks ago several people mentioned reading the first book in the Floors adventure by Patrick Carman. I was pretty excited to see so many of you finding this one, because it was one of my favorites last year. When Karen and I visited Cover to Cover the new Floors adventure, 3 Below, was in the pile of ARCs and I picked it up. I finished it before leaving for my annual Dads' Camp Golf Trip in Michigan and I can definitely say, I like it as much as the first. Very much in the tradition of Charlie and the Chocolate Factory, Patrick Carman takes the Whippet Hotel, owned by Merganzer D. Whippet, an eccentric inventor and places it in the hands of a child, Leo. Book 2 starts at the wedding of Leo's father and his friend Remi's brother. The festivities are interrupted when Mr. Whippet appears in a balloon and sends the parents off on an all expense paid honeymoon freeing the boys up to discover even more magic in the Whippet Hotel. The first thing they discover is that the hotel is behind in it's taxes and Mr. Whippet sends them on a quest to obtain some mysterious items, four floogers, a zip rope and the iron box. The boys have no idea what this means, but because of their love for the hotel, they begin searching. In the process they must avoid contact with the evil Ms. Sparks who has designs on owning the Whippet herself and her cohort Mr. Carp a wimpy tax attorney who is put in charge of watching the boys. The boys discover new floors below ground in the Whippet, one that resembles a jungle and another that is filled with gears of all sizes, some of the gears resemble saw blades, and the adventure is on. 3 Below is more mysterious than the first, and kept me involved to the end. 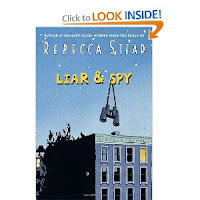 The story is filled with enough twists and interesting characters to keep the reader guessing and turning the pages. 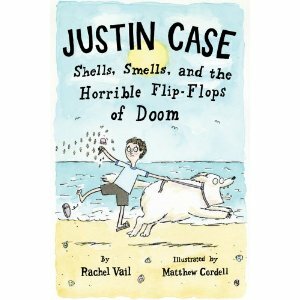 I'll be recommending this one to my 3rd graders and up, but only if they've read the first one. 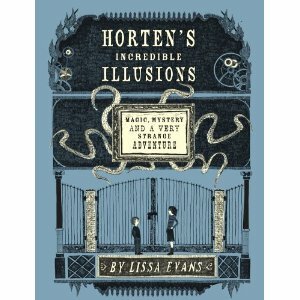 It will also make an excellent selection for the 4th graders when they come looking for mysteries in October.